Arthur Honegger (1892–1955) studied at the Paris Conservatoire until 1918, apart from a brief interruption at the beginning of World War I. He had composed ballets and incidental music before coming to international attention with the incidental music he wrote for René Morax’s biblical drama, Le Roi David (1921). The work was a success, both musically and with the public. Shortly afterward an enthusiastic patron provided an opportunity for Honegger’s work to be heard in Paris. The transfer of a stage work to the concert hall, however, posed a problem, which was met by the introduction of a narrator. In this way, Honegger revived the oratorio, giving it new vigor by the use of spoken narration. The genre was a productive one and some years later gave rise to another masterpiece, Jeanne d’Arc au Bûcher (1938). Often present in French theater but rare in oratorio, melodrama—spoken text recited against a continuing musical background—unites the music subtly to the text in Le Roi David. 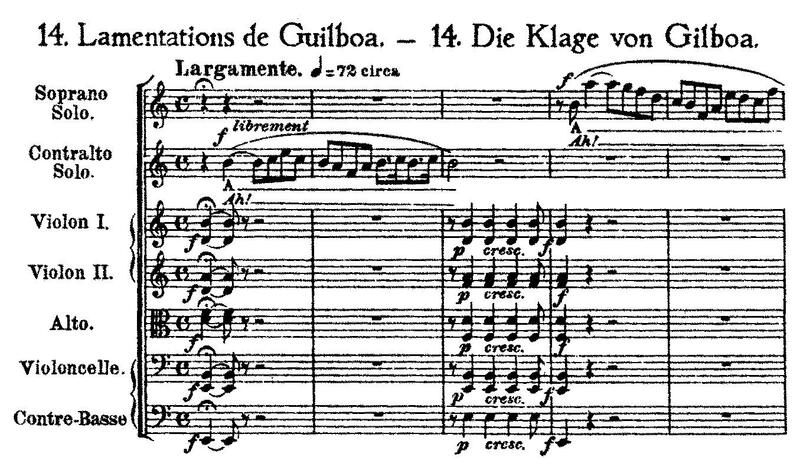 The mournful atmosphere comes principally from this unusual combination of music and speech, which especially reinforces the poignant sorrow of the last section of the first part, the “Lamentations of Guilboa.” In this section, Honegger uses wordless vocal lamentation to express the emotional sorrow of David. Before the music begins, the narrator relates the defeat of David’s enemy, King Saul. He describes David weeping before his people for the death of Jonathan and Saul. With the entrance of the music, the narration continues, as the narrator takes the role of David himself in the first person. A wordless contralto issues an exotic, phrygian-tinged melody, followed by an answer from the wordless solo soprano. Following the introduction, the full women’s chorus enters in measure 17, presenting the main melodic idea that forms the basis of the rest of the section. A contrasting section begins at measure 39, where the women’s chorus sings “Pleurez, Saül!”—the only text in the movement other than “A”—in response to the narrator. Following this interjection, the sopranos and contraltos sing the main theme once again, this time in paired imitation at the interval of a tritone. 1 Arthur Honegger, Le Roi David (Lausanne: Foetisch, 1952), 60. 4 See in particular: Claude Debussy, Nocturnes, mvt. 3, “Sirènes,” mm. 58–72, and also the “Siren” theme, mm. 26–27.